My first camera was a Kodak Retina entrusted to me by my father three decades ago. Back then, this camera had already a long history. 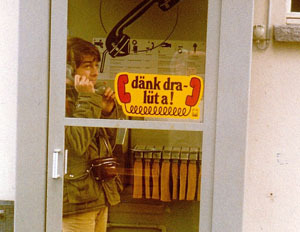 The picture to the right shows me using this camera on an early "mission" in Switzerland. Since then I have made it a habit to take a camera with me wherever I go. 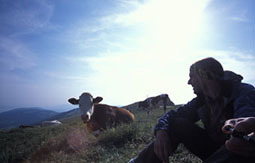 Several years later, I returned to Switzerland to shoot self-portraits with cows. I also started to shoot landscape portraits - not only in Switzerland. This website contains a selection of my pictures. I hope you enjoy looking at them.